Parents and faculty from J.H.S. 145 Arturo Toscanini in The Bronx held signs in opposition of the school's closure at a Panel for Educational Policy meeting on March 23, 2017. NEW YORK CITY — City officials voted Wednesday to close five of its struggling schools in The Bronx and Brooklyn despite strong opposition from elected officials, parents, teachers and students who called on the Department of Education to reconsider. The city’s Panel for Educational Policy approved the shuttering of J.H.S. 145 Arturo Toscanini; the Leadership Institute; and the Monroe Academy for Visual Arts and Design in The Bronx; along with M.S. 584 and the Essence School in Brooklyn. All five are currently designated as renewal schools, identified by the city for their under-performance and given a timeline for improvement with support from the DOE, according to education officials. More than 25 speakers spoke against the closure of J.H.S. 145 at the nearly four-hour meeting at Manhattan's High School of Fashion Industries on Wednesday night. “When we make decisions about schools, we always decide what is best for children,” Fariña told attendees. “All the schools up for vote today have been very carefully thought about. ... I will say, the test scores [are] never, ever the single most important thing,” she said, adding that officials consider factors such as student enrollment, capacity and other locations where students can receive better resources. Community Education Council 9 voted against the proposal to shutter J.H.S. 145, representatives said, and elected officials such as Bronx Borough President Ruben Diaz Jr. wrote a letter urging the DOE to keep the school open. Parents and teachers argued that they did not receive promised resources, and that the school has struggled with no bilingual teachers while having a large percentage of English Language Learners. Others felt the decision was already “a done deal” before the vote, and that the community’s voices “do not matter,” one speaker said. The PEP voted 8-5 in favor of closing J.H.S. 145, as audience members yelled “Puppets!” and an alumna broke down in tears. Stakeholders from the Essence School in East New York pushed the DOE to allow the school to operate, with students saying they lived close by and that safety was a major concern if they were forced to travel elsewhere. Also in Brooklyn, Crown Heights’ M.S. 584 is slated to shutter in the fall after the PEP voted unanimously to close the school, which officials said has suffered declining enrollment and poor performance. According to the DOE, the middle school currently serves 78 students in grades six through eight this year, down 57 percent from 180 students served five years ago. Academic performance on annual ELA and math tests at the school are low as well, according to DOE statistics. Last year, only 12 percent of students at M.S. 584 were proficient in ELA and 8 percent were proficient in math. The panel’s agenda also included the truncation of Bedford-Stuyvesant’s P.S. 262 El Hajj Malik El Shabazz School, which will lose its middle school grades in the upcoming academic year. While not a renewal school, it suffered from low enrollment and lack of resources, officials said. The DOE looks to boost enrollment in School District 16’s remaining middle school options, which officials said are higher performing and can support greater programming. In the case of Crown Heights’ M.S. 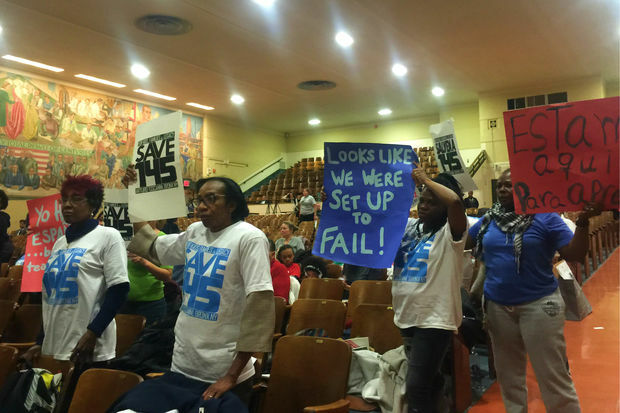 584 and Bed-Stuy’s 262, the community education council voiced their support for the plan at an earlier meeting, saying they have been working with the superintendent to improve the district. “We think it makes sense,” CEC16 President NeQuan McLean said of the closure and truncation. “Those students were getting the best education they could provide with the resources at the school, but not the best education that’s possible,” he added. ►Renewal school Young Scholars Academy of The Bronx will merge with North Bronx School of Empowerment. ►Automotive High School in Williamsburg, which is a renewal school, will merge with Frances Perkins Academy. ►Renewal school Frederick Douglass Academy IV Secondary School will merge with Brooklyn Academy of Global Finance in Bed-Stuy.